It’s Halloween month, which is the perfect time to dive into our content team’s picks for the top 5 atmospheric games on Utomik. Before getting into the choices though, we wanted to clarify: what did we mean when we meant atmospheric? Spoiler alert: we did NOT just mean horror. We selected games that had strong and impactful emotional environments. These are the games that access and ignite the imagination from the setting, sound, and visuals: plot doesn’t necessarily have to be there for you to feel like you’re there, but of course, good writing helps build the world and suspend our disbelief. We picked the games in Utomik we felt made us feel like we were really there. We always like to point out that Utomik adds 5 games a week, so this list is one that we’ll definitely have to revisit! Until we do, why not comment with your favorite atmospheric titles on Facebook? Our first pick shows that atmospheric doesn’t always mean creepy! Shelter is a relatively short tale where you protect your badger pups as a den mother. The graphics are not hyper-realistic but, combined with excellent sound design, you’ll quickly feel like you’re traipsing through nature with your family. This is a world that feels real not only because of how it sounds but because of how the little things come alive as you find peaceful moments in-between levels. Frogs jump, pups ask for more food, and you’ll quickly find that nature is as beautiful as it is treacherous. With a dark and brooding atmosphere, Typoman: Revised follows the journey of a small, but capable Hero through what seems to be the decrepit remains of a once well-kept city. You feel the sense of destruction acutely in these environments, and the use of words spelling out foreboding things like DOOM and HATE add to the tension that builds quite effectively as you progress through the world towards what you hope is a positive ending for your character. Using only voice acting and minimal action on-screen, Code 7 is an example of how a game can build incredible atmosphere by allowing the imagination of the player to really take hold as you try to rescue your fellow team member from a not-so-deserted spacecraft. The minimal music creates a sense of uneasiness and anxiety, and the use of your role as a hacker to justify the display you’re shown in the game pushes the gameplay from something happening in another world to something that’s happening to you. The subdued color palette, sounds, shadowy imagery, and sound design all contribute to an oppressive feeling in the game, Beholder. This game constantly makes you feel like you need to look over your shoulder while playing! The definite Orwellian vibe and well-done writing immerse you immediately into your role as a landlord having to decide what to do with the information you discover about those around you. While both Metro 2033 and Metro Last Light Redux have incredible atmosphere, we had to pick one, and Metro Last Light was the sure winner between the two. This game is BEAUTIFUL, which absolutely helps with letting you feel as if this is a world you could potentially visit in the future. Walking aboveground, you feel like life above the sewers has moved on and the desolate cities feel strangely lush. At the same time, the world in the subways below feel lived in and teeming with activity. Not only are the visuals and world-building top-notch: the sound design and music seal the deal in having this as our number one pick. You really feel claustrophobic hearing the echoes of the sewers, and coming up out of the ground you can almost taste the fresh air. 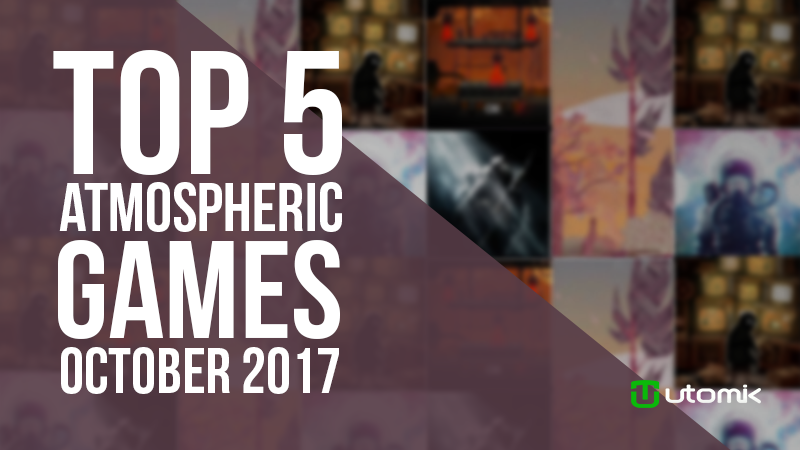 These were our picks for top 5 atmospheric games in October. There are over 645 other games to choose from, with games being added constantly. Do you have any that you feel should have made the list? Comment with your thoughts on the video or in our Facebook: we'd love to continue the discussion!